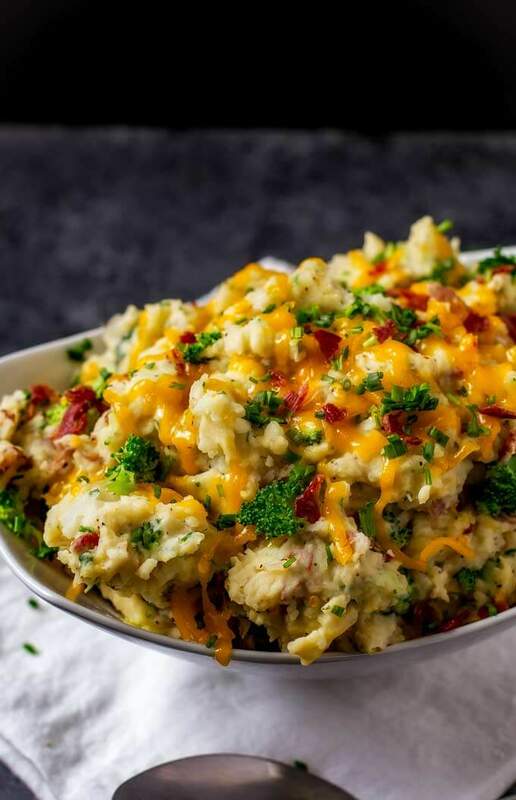 Cheesy Mashed Potatoes with Bacon and Broccoli are the perfect comfort food recipe for your holiday table. Serve them right away, or make them ahead and reheat as a casserole. My favorite thing about fall is comfort food. When I think about comfort food, one of the first things that comes to mind is potatoes. There are so many different ways to enjoy them; they are a culinary canvas of unlimited possibilities. It is no wonder that they are a staple in every cuisine around the world. I love that they potatoes the opposite of fussy. They are easy to stock up on since they keep so well. I can’t tell you how many times I haven’t known what was going to go with dinner and I’ve been saved by a bag of potatoes in the bottom of the pantry, along with vegetables from the freezer. Talk about convenience! Of all the ways to enjoy potatoes, my favorite is mashed potatoes. They are pure comfort food from childhood! These days I tend to dress my mashed potatoes up a bit. 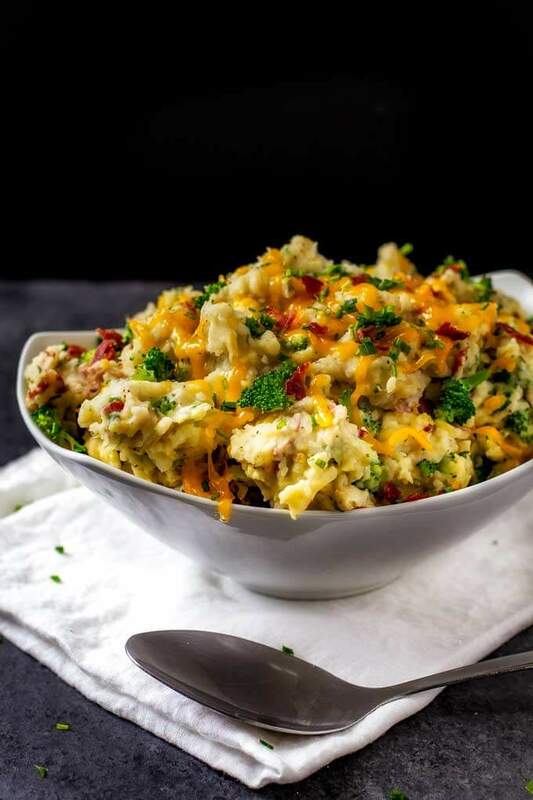 Today I’ve got Bacon, Broccoli and Cheese Mashed Potatoes that are perfect for your holiday table…or Tuesday night. Although it isn’t what my mom used growing up, I love using red potatoes when I make mashed potatoes. The rustic look and texture is just perfect to me. They are waxy, moist and smooth, giving them the ideal texture for creamy mashed potatoes. They are also perfect for roasting, in soups and stews and in salads. It is so easy to elevate your basic mashed potatoes with ingredients you probably use all the time. 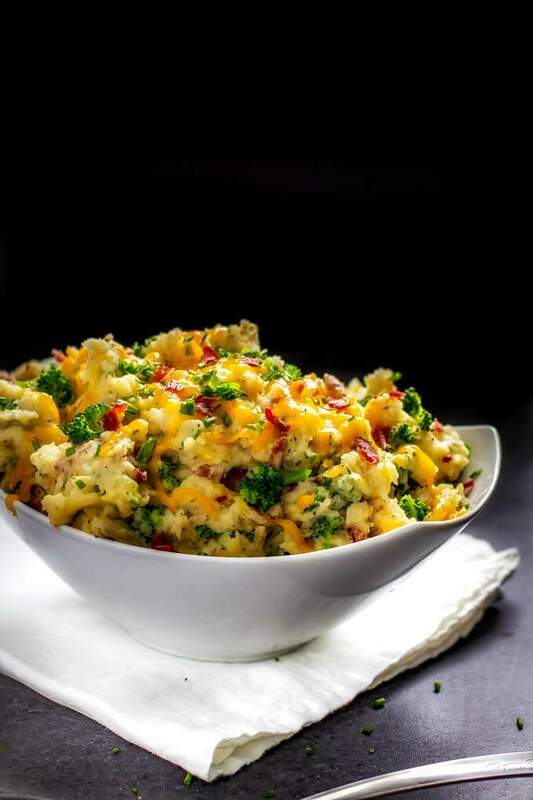 With Bacon, Broccoli, Cheese, and Potatoes, you have got a kid-friendly combination that the whole crowd will love. Want to make these ahead? Not a problem. I’ve got instructions to turn this into a make-ahead casserole that is perfect for the holidays. 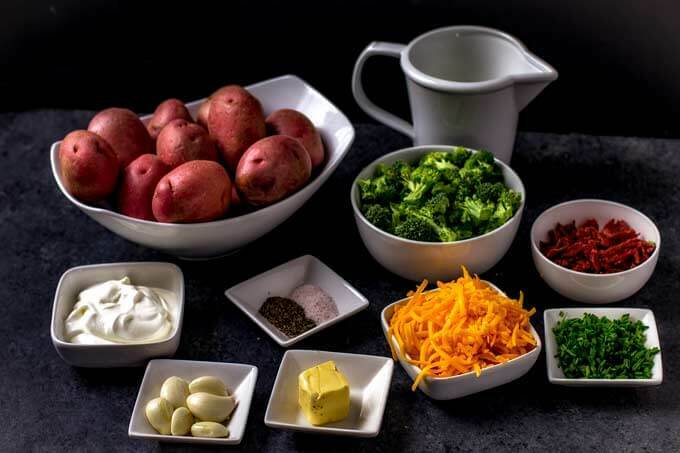 For more potato inspiration, check out the Potato Goodness Facebook page and the Potatoes USA website. 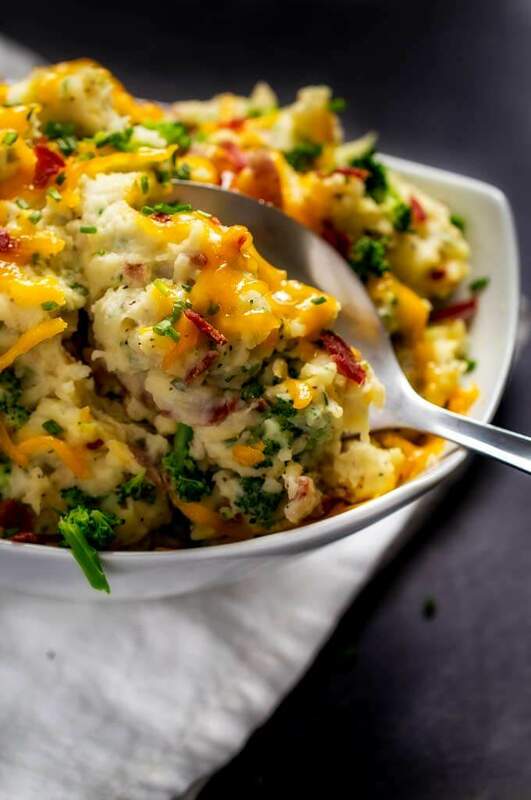 Cheesy Mashed Potatoes with Bacon and Broccoli are the perfect comfort food recipe for your holiday table. You can even turn them into a make-ahead casserole. Place the potatoes and garlic in a saucepan and cover with water. Salt well. Bring to a boil and then reduce heat to medium. Simmer until the potatoes are tender, about 15 minutes. Drain and return to the pan. While the bacon and potatoes are cooking, steam broccoli for 5 minutes. When the potatoes are almost done, bring milk to a simmer. Add butter and stir until melted. Pour the mixture over the warm potatoes and add salt and pepper. Mash with a potato masher. Stir in cooked bacon, broccoli, sour cream, 4 ounces of cheese and chives. Mix until well combined, and top with additional cheese. Tip: To make ahead, transfer to a 2 quart baking dish. Allow to cool and then press plastic wrap directly into the surface. Refrigerate. To reheat, preheat an oven to 400 degrees. Allow the potatoes to stand at room temperature for 45 minutes. Remove plastic wrap and top with additional cheese. Bake for 35 minutes, or until warmed through. This is also very close to one of my favorite comfort dishes. I agree, nothing soothes like potatoes – and they are just so easy. This is the perfect side to almost anything. It’s got veggies and it’s got cheese. What the heck could be better than that?! Nothing. The answer is nothing. So what we have here is a side consisting of mashed potatoes, broccoli, and cheese? This is the trifecta! You could not have picked a better side EVER. This recipe looks absolutely delicious! I am making a roast this weekend and this will definitely be one of my side dishes! I love everything about this recipe. Every single ingredient makes it the perfect side dish. This looks like the ultimate comfort food. I can’t wait to try this recipe out on my family. I have a feeling it’s going to be a new family favorite. These are sure to be a hit in my house. I will have to get the ingredients I need to make some this weekend. They look so delicious and easy to make. YUM! 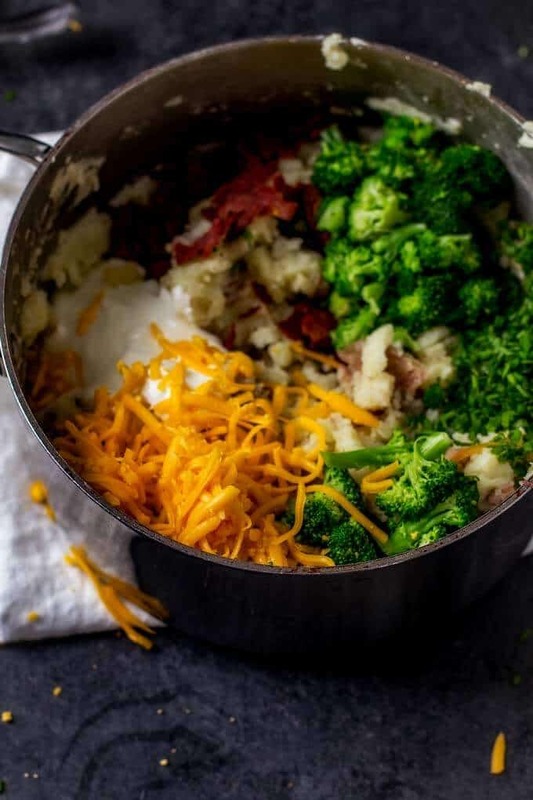 What a great comfort food dish, with potatoes broccoli and cheese you can’t go wrong! YUMMMMMM!!! These look delicious! 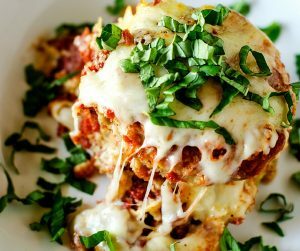 I will definitely try out this recipe this weekend, thanks for sharing! This literally looks like heaven. Amazing! I would never think to pair mashed with these but I can imagine it is soooo good! 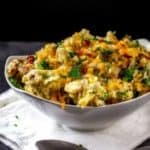 I never really thought to put a lot of stuff in mashed potatoes, but this sounds great! 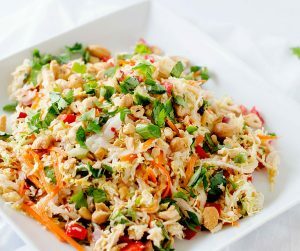 What a great way to sneak in some veggies too. My kids actually like broccoli and I’m sure they would like this. I’ll have to save the recipe. Ooh this looks really good. I love finding new dishes to feed the family, thanks for sharing! Wow! This sounds so good. I’ve never added broccoli, but I have made something similar. 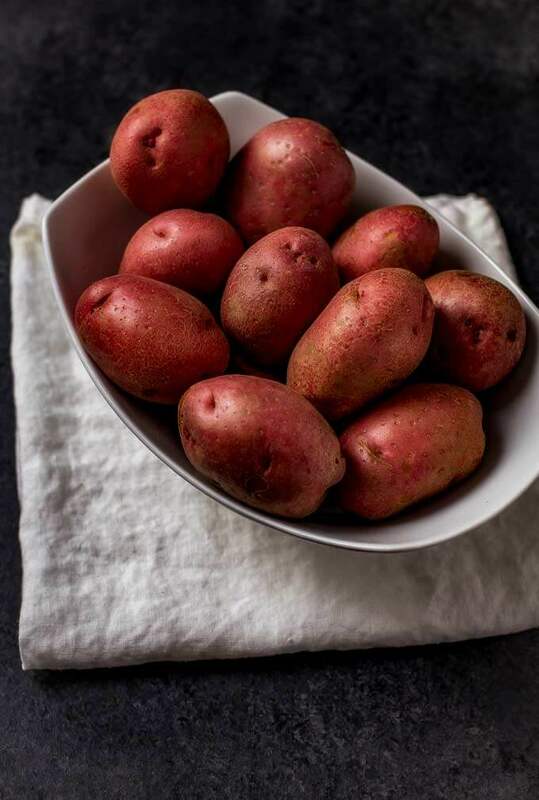 I love the texture of the red skinned potatoes for mashed. Love your blog, thanks for all your great recipes! That looks so good. I bet my family will love this. I’ll have to put it on the menu soon! all three of my favorite things! this will be a hit at our house this weekend. I just might make this for thanksgiving too! You had me at bacon. We love flavored mashed potatoes any day of the week around here! You’ve combined 4 of my favourite foods into one dish. YUM! I can’t wait to try this. Yummy! I love everything about this recipe, they make up one of my favorite meals. I normally have all of these things in the form of a loaded back potato. This is a nice twist though. That looks amazing! And you just made me hungry. Too bad I don’t have all the ingredients needed. That would have been our side dish for tonight.